Wilt cabbage in a large pot of boiling water. (Do not over scald).. remove from water and set aside. Mix crawfish, rice, tomato paste, melted butter, and bread crumbs. Add seasoning and mix well. Remove spines from cabbage leaf. Put leaf on board, spine down, and put filling in leaf. Do not over pack. Roll tightly and arrange rolls in rows in pot. 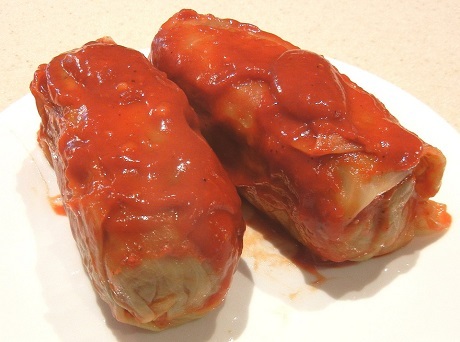 Pour one half cup water mixed with 2 tablespoons tomato paste seasoned well over stacked rolls. Place a heavy flat dish on tops of rolls to keep together. Cook over medium heat 30 to 40 minutes. Pour lemon juice over rolls 10 minutes before cooked. Recipe courtesy of Catherine McCoy Edwards and "The Best of South Louisiana Cooking".